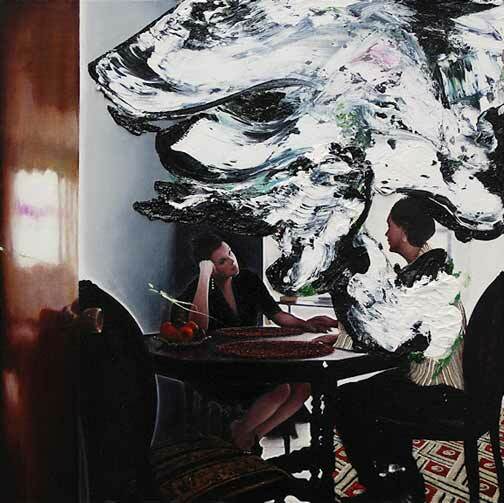 NEW YORK - onetwentyeight is pleased to present MAXWELL STEVENS, SUMMER TABLE PAINTINGS, a new solo exhibition testing the boundaries of painterly abstraction and photorealism within the context of contemporary portraiture and delicately painted modern interiors. In this selection of oil paintings spanning several years, the viewer encounters an array of intricacy & detailed brushwork executed in the individually rendered scenes underlying each picture. These intimate, miniaturized portrayals are subsequently overpainted in thick impasto, fragmenting and disrupting the initially calm scenery. This interplay arrives at a newly hybridized pictorial space, one that makes allusions to both the Dutch Golden Age and to Abstract Expressionism, yet clearly would not exist in any other era than our own.